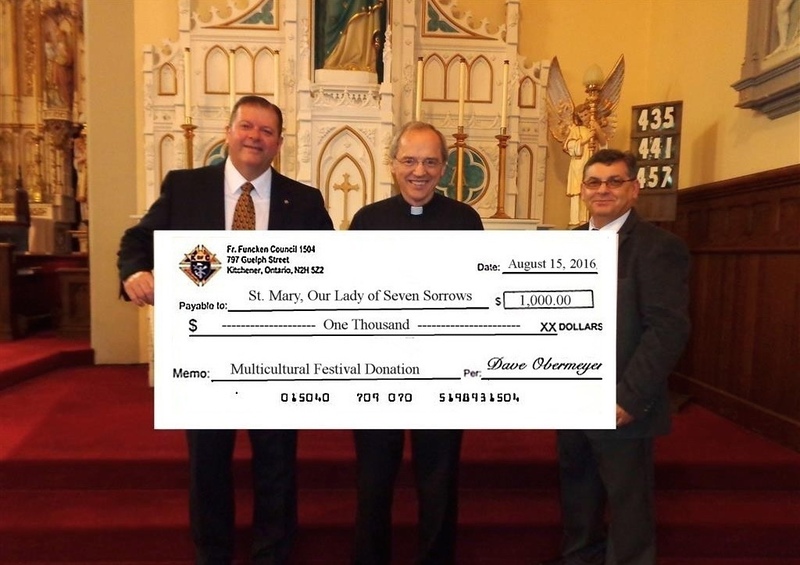 Pastor Father George Nowak, CR., accepts a $1,000 cheque from GK Dave Obermeyer (l) and DGK Mike Szabo (r). The St. Mary’s booth at the Kitchener Multicultural Festival was a huge success thanks to the many volunteers. Through a generous K of C donation from Council 1504 they were able to give out almost 200 free booklets and 200 CDs with information about the Catholic Faith. A prayer intentions box was very popular with prayer intentions offered up at Mass at St. Mary’s prayed for by the St. Mary’s Prayer Network. Through this outreach, it was encouraging to meet Catholics who had been away from the Church for a long time. Asking questions were non-Catholics inquiring about the Catholic Faith, and even some atheists. This gave the volunteers the opportunity to pass out excellent free resources and encouraging people in their search for the Truth. The St. Mary’s participants expressed keen interest to take part in the Multicultural Festival next year saying that Christ desires to draw all people to Himself, and it was a thrill to play a roll in Christ’s mission in this way.